1P1Q screening estimates the complex voltage V vector following a disturbance using simulation tools Matlab and MatPower (Free, open-source Electric Power System Simulation and Optimization Tools for MATLAB). This project considers either an outage if generator 2 or generator 3 , but not both, affecting the voltage. * The author found out that to approximate the 1P1Q bus flows to that of the AC solution, that the outage generator branch had to be modeled as “almost-off” so that power would not want to flow there. The pre-contingency solution considered it in service, however, when the generator is out, there is no load and incentive for the power to flow down the node to the bus. The AC solution correctly assigned a 0 flow to the post-contingency solution, but in the 1P1Q process, without the branch impedances taken to infinity, there would be >0 (big number) of branch flow on that branch, which does not make sense. By changing the branch impedance to near infinity, it corrects the current calculations and hence the power flows. 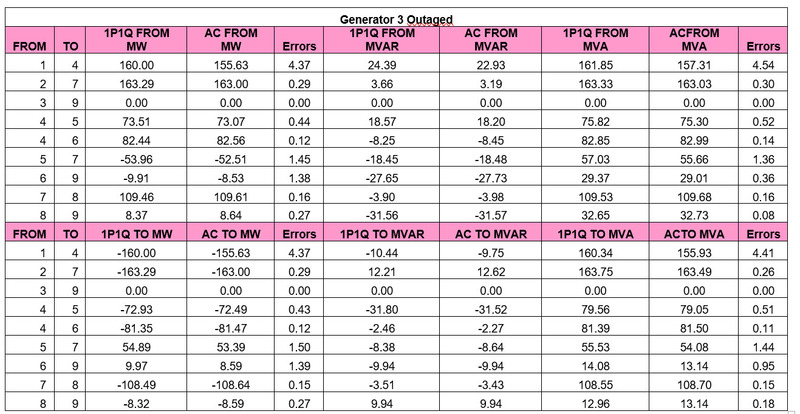 The 1P1Q method produced a good estimation for the generator outage compared to the AC solution. The most error in approximation came on the radial branch leading to the swing bus and the branch leading to the load. The method estimated both the MW and MVAR in good approximation. 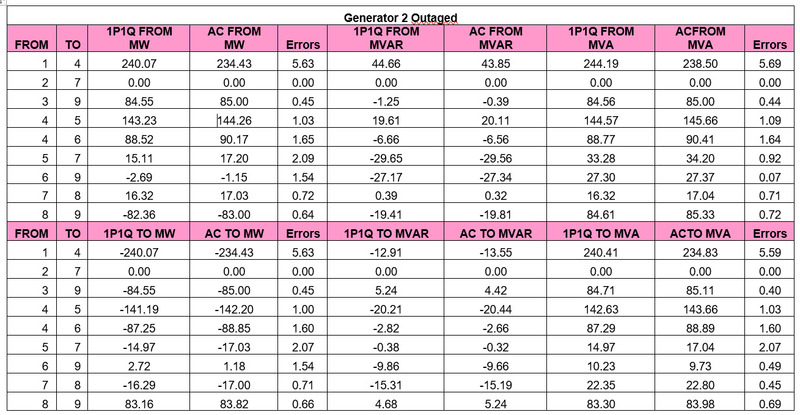 The results of the bus, Vmagnitude, and Vangles (in radians) were outputted in MATLAB after each 1P and 1Q half-iteration for a generator outage. The updated estimated complex V was then used to calculate the complex power branch flows. The post-contingency branch flows for the 1P1Q method is outputted at the end of the 1P1Q program. A separate program called “program3ac.m” runs the AC portion of the power flow analysis. It is important that before you run the AC solution, that the generator to be out, is commented out of the gen data structure in the wscc9bus.m file and saved. The AC solution looks only at the structure of the bus. The results of the AC power flow program will display the same complex branch power flows which are in good approximation to the 1P1Q method flows. The comparison of the flow values between 1P1Q and AC was done in excel. The excel file is attached for your reference. The demonstration of Matlab code, output, and tables are discussed in the project report that you can download in PDF format here. An Excel comparison sheet (results) of the project is here.